This template uses Microsoft Visio software. If you do not own Microsoft Visio license, use the Powerpoint version here. Shows clear change using numerical values. Clarity for stakeholders and sponsors. Show what change is expected, and when. Show Benefits and KPIs in numerical values. Update by right-clicking and change dates. Break your programme into phases. Objectives – shown as red diamonds. show clearly the expected benefits of your programme. i.e. the change from one position/situation to another. 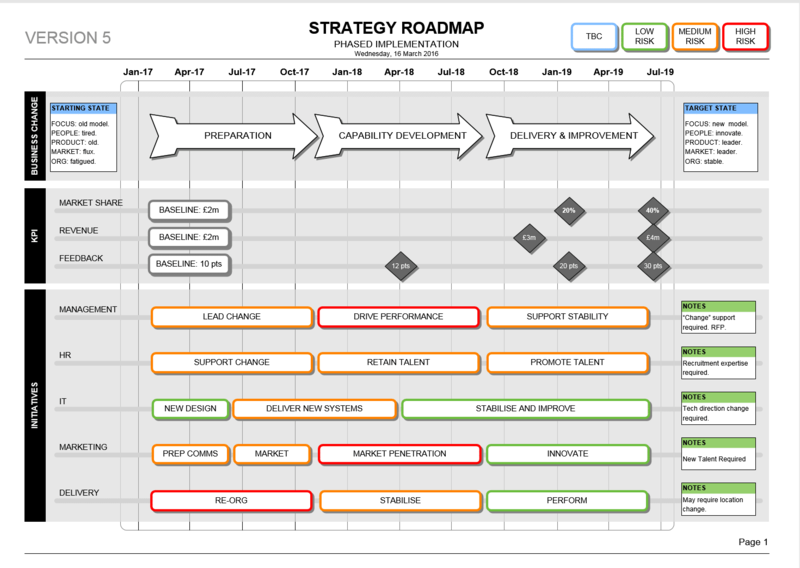 The Change Programme Roadmap shows details on the Timeline, Phase and Key Activities areas. Rating for Change Programme Roadmap: Transitions & Benefits Template (Visio) Template: 4.5 out of 5 , based on 3 customer reviews. Show your teams, workstream plans, job roles & names, alongside your projects & timeline. This Product Resource Delivery Plan shows the whole picture.